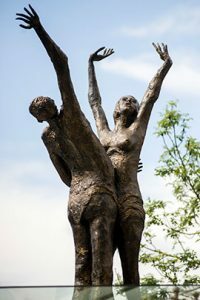 30 years after it was last on display…the Lovers Statue is back in Doncaster! In the 1960’s this risqué sculpture was a meeting place for a lot of Doncastrians. We completed the lighting installation to bring this iconic statue to life, holding pride of place at Waterdale in Doncaster. This was in partnership with St Modwen, who made sure the statue was carefully restored before it began its journey back home. We were proud to have worked on such an iconic part of Doncaster’s history. For further information about the work RJ Electrical have completed at St Modwen or the services provided please contact us on 01302 730 600.